You can use the following form to pre-order your shirts for pickup at 2018 PPD! 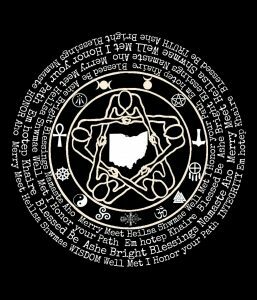 This year’s shirts have a dark background with white print – this Pagan Pride image on the front, and the DPC logo + welcome phrases on the back. If you want to order multiple, use the “Continue shopping” link from the Paypal Cart and it’ll bring you right back here to choose another combination to add to the cart.